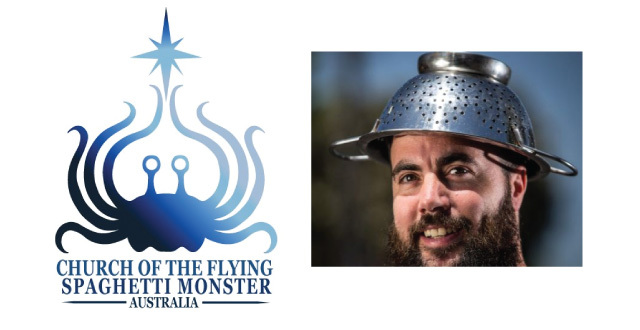 « Pastafarians Marching For Science — Contradiction? If you’d thanked The FSM, Mary, I would have believed everything you wrote. Has this been ratified by the NSW state government yet? I just wondered as my Licence is up for renewal in December. While I love the idea of FSM and harpooning religions on pointy satire, I have to strongly disagree with this headgear nonsense being allowed in ID photographs. I think all serious religions should not be allowed concessions in ID photographs either. The FSM collective should be working against this rather than unwittingly reinforcing it with their own joke. John_S, it is quite possible that Pastafarian head-covering inadvertantly draws attention to some absurd doctrines and customs of the false religions. We still await a legal definition of ‘proper religion’: what could be so difficult about that? A legal definition isn’t even relevant imo. No concessions for anything, from any group/tradition/church/ideology/cultural identity, should be made for obscuring facial/head features in ID photographs. Or indeed while walking around in public in general, particularly crowded areas and banks etc. I beleive that is the point that is trying to be made John. Yes your right, everyone’s face should be clearly seen when in public and on official documents.. So why the problem with a colendar on your head? Because it sounds ridiculous I assume? Well no more ridiculous that the other forms of recognised religious headwear already legally accepted in society.. So if Pastafarians are not legally aloud to wear a colendar on their head wherever and whenever they want to in align with their own obligations to their religion, then why should any other religion be allowed?